There was a time when there would be 8 to 10 Pro Farm Tractors at any given pull. Over the past several years there has been a downtick in the number of pullers. 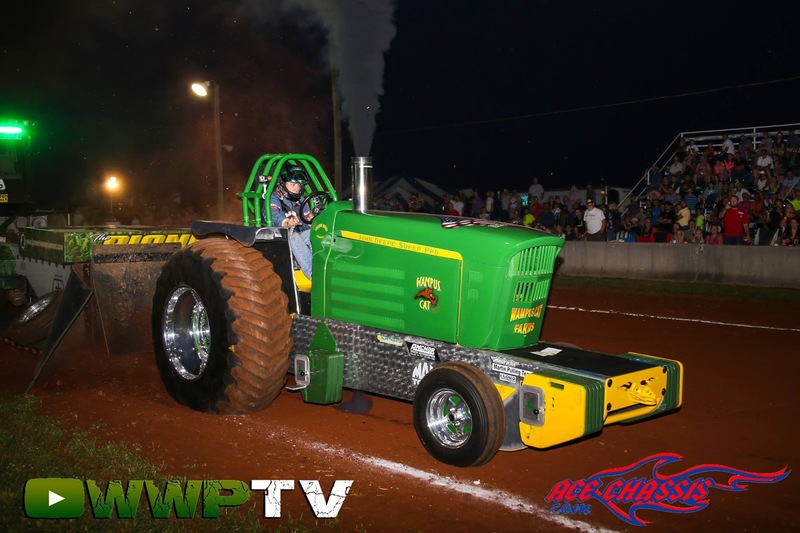 Last years passing of Ed Gentry and his "Big Ed's Turbo Express marked a heavy blow for this band of pullers. Like most stories, it doesn't end there. Several of these pullers run with Interstate and compete in the Keystone Nationals In March every year. The Super Pro Farm class features a 540 cubic inch block with a 3000 series P Pump 13mm and one (1) turbocharger with 3.0” inlet. They say these babies can run you between $80K and $120K and less if you can do most of the build with your buddies. I traveled to a shop earlier this year where a few guys were fine-tuning the plumbing under the hook just to give it a better flow, make repairs easier, etc. It isn't uncommon for these guys to be in the shop anytime when it is rainy or nothing is going on. I have been hearing about a John Deere build for this class for several years now. I knew one of the builders Bob Martin who previously ran his International 966 as a 7800 Light Pro Stock (https://youtu.be/7OtwvkHtDlo?t=5m32s), so I knew the tractor would be solid inside and out. But to hear Mike Stinson of Ace Chassis come in and help him with the sheet metal, simply blew my mind. So the story goes Mike told Randy to bring his tractor down to his shop just outside of Nashville Tennessee and he would finish it for him. Randy told Mike I can't do that right now. Mike insisted and he kept it in his show a while. When Randy was to go pick it up. Randy went down and they worked on it some that night. That Sunday, the fellas went to church where Mike led Sunday School, had Sunday dinner, and proceeded to work all the way up til 11:00 when they loaded the tractor up to go home in Roanoke Virginia. Randy got the name Wampus Cat from his dad when he was 16 years of age. The name has been on ATVs, dragsters, the farm in Roanoke, you name it. I told Randy, "You know there have been several Wampus Cats in pulling? ", he said he didn't have a clue and was intrigued. And who could not love a mythical cat-like mystery rivaling only the Yeti, Chupacabra, and Bigfoot which is probably just a brown Yeti? So needless to say this was a great night of pulling and I was ecstatic to film and shoot the Whampus Cat. Blue power comes to the Super Pro Farm class as well. Adam Ritchie is a wonder with the wrench. So much so he has put himself among the elites in Virginia pulling with three (3) 466 Hot Farm titles back to back. He brought Pap's Blue Ribbon, an homage to his late dad and Harrisonburg Virginia poultry farmer among other things, up to the level of Pro Farm. 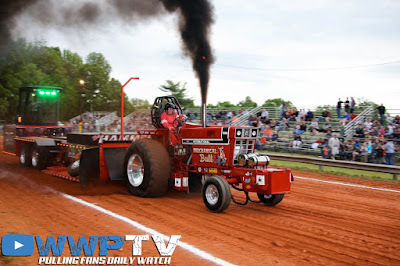 He also runs Blue By You, which if you have been following us on YouTube and YouTube Live you will recall this tractor did really well at South Boston in 2017. Blue By You was built for the Pro Farm class from the word "go". It has been a middle-of-the-pack tractor but has been eeaking is way up to the top of the pack for several pulls now.